Source: Hardcopy courtesy of Simply Read Books. Thank you! Little mouse Mo wants to play. But big bear Beau is tired, and getting ready for sleep. Luckily Mo finds the perfect way to have fun: by copying Beau! Stretching, yawning, bristling his fur–Mo copies it all, until he too is ready for a nap. Meet these two adorable characters in this perfect bedtime book. In a recent review of Jory John’s Goodnight Already! I noted that the ‘can’t go to sleep’ theme in picture books has been done multiple times as it makes for fun storytelling. 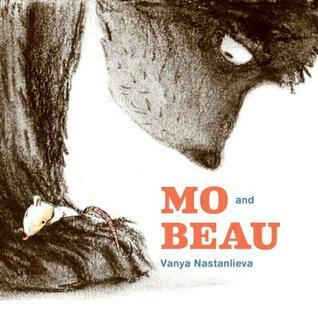 Here, in Nastanlieva’s beautiful Mo and Beau, a similarly-themed story is told in a fresh voice to great success. The pared-down nature of the story- with just a few words per page of little Mo mimicking big sleepy Beau’s actions- really allows for the author’s wonderful illustrations to shine. What I adore each time I read through this picture book is the juxtaposition of the coarse, bristly, wild nature of Beau the bear with the lighter, fluid- almost precarious- depiction of tiny Mo the mouse. The contrast in actions of the two characters is done wonderfully here- which makes their final (adorable) sleeping pose all the sweeter. Mo is drawn with such verve and expressiveness: this little mouse, along with Mini Grey’s Hermelin, may be one of the most winsome mice I have had the pleasure of meeting in a picture book. Overall, this is a lovely picture book. It would work well for a younger storytime audience- perhaps for a toddler one- to read aloud and have fun with acting out all of Mo’s little-big actions. It would also work, as per the book description, as a quiet-down or ‘get ready for bed’ story, if read in a gradually hushing voice. I found Nastanlieva’s illustrations endearing and am keen to go back and read her picture book debut, The New Arrival. Do take a perusal of author/illustrators Nastanlieva’s online portfolio if you can; it’s well worth the look! Mo and Beau is published by Canadian (Vancouver-based) publishing house Simply Read Books. I have read many titles from this publisher (titles I have reviewed, titles I have come across during my years of work at the library and titles I have personally purchased), and they seem to have a wonderful knack for putting forward distinct, innovative and exceptionally illustrated titles.